Fashion designing is a highly innovative field and perfect for people who are extremely creative and have an eye for detail. The job is so challenging that to stay successful and popular, the designer needs to have a great sense of style and come up with new ideas constantly. As people with new ideas stream in, the designer has to stay on the competitive edge all the time, relaxing only when he has been able to produce top class results. A successful designer will remain alert at all stages of production right from visualization of the clothing to its conceptualization and eventual execution. While he is driver by creativity, the fashion designer must have an extremely good business sense too. Without understanding the nuances of budget, promotions and sales, he cannot become successful, commercially. Fashion designers are in great demand in clothing stores, offices, workrooms, advertising agencies, films, weddings, stage shows, event management companies and factories. With sufficient experience, the fashion designer can open his own boutique. 13 new job listings for this search have been found in the last calendar day, compared with 137 in the last 72 hours and 189 in the last week. 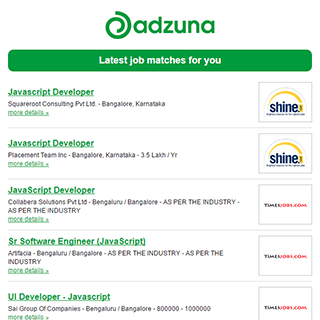 The Adzuna recency index score for this search is 1.69, suggesting that demand for Fashion Designer jobs in India is increasing. Get the latest Fashion Designer Jobs in India delivered straight to your inbox!